Sometimes brick looks beautiful — and sometimes it’s an eyesore. Depending on the style of your home, a brick fireplace or wall may detract from your ideal ambiance. Although painting the brick in your home has been touted as an easy DIY fix, it has its downsides. Be careful before whipping out your roller and painter’s tape — there are some important considerations to keep in mind before tackling this home project. 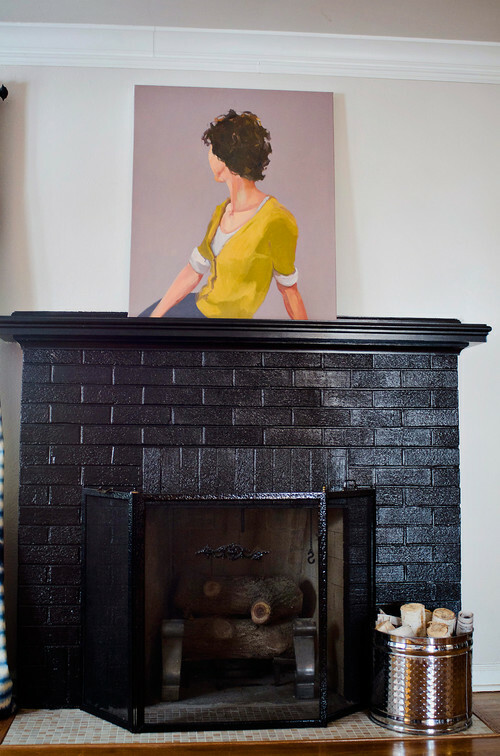 We talked with three professionals to get their take on painting brick. Diana Zumeta ofBrick Restoration, Scott Crocker of Crocker Breslin Architects and Rick Watson from Sherwin-Williams give us their two cents on the risks involved in painting brick. Think carefully before painting interior or exterior brick. Brick is chosen as a building material because of its durable and built-in color — of which there are more choices today. “Most brick was never intended to be painted,” says Crocker. “Long-term, maintenance-free painted brick requires careful planning.” According to the Brick Industry Association, if you paint your exterior brick, you should be repaint it every three to five years. The quality of your brick also should determine your choice. Brick that’s chipping, deteriorating, molding or in overall poor condition is always a bad candidate for paint. Paint blocks the natural pores in the brick’s surface, which can cause existing problems to become exaggerated over time. “When water seeps in through the mortar, it also seeps into the brick through the inside, and since the bulk of the surface area is blocked, the moisture cannot evaporate off,” says Zumeta. Often this causes the paint to chip off. Also remember that removing paint from bricks is no easy process. Chemicals have to be used, and often the paint won’t come completely off. If you don’t like the look, you may be stuck with it. “Ask yourself if you’re covering up something that should be addressed separately,” says Crocker. He recommends getting in touch with the original owners or the builder who installed the brick, whenever possible, to uncover any problems that might arise. “You have to be very careful when you’re changing the exterior makeup of a wall,” says Crocker. Moisture is a concern that’s usually apparent right off the bat. Water can enter brick through brick pores, incomplete mortar joints, sills, copings and other gaps. Make sure your brick is completely dry before you paint it — the risk of long-term or immediate damage is less likely. The natural chemical property of bricks may affect your paint’s durability as well. According to the Brick Industry Association, most bricks are neutral, but mortar often has a basic alkalinity. Paint products can be affected, so alkaline-resistant primer is usually recommended. “Efflorescence” is a big word for that annoying white residue that often appears on older brick walls. This residue is made up of deposits of water-soluble salt buildup, often from moisture inside the brick. Remove the efflorescence with water and a stiff brush before painting your brick, and wait to see if it returns. If it does, you may have a bigger problem on your hands that requires professional help. “Most project complications occur when people rush the preparation process,” says Watson. “If your brick is brand new, wait at least a year before painting it to allow for drying, weathering and leaching.”Always clean brickwork before painting it, and allow it to dry for at least 24 hours before painting it or applying a water repellant. Don’t use acid cleaning solutions when cleaning your brick — stick to simple water and soap. Acidic solutions can result in paint chipping. Seal any cracks and repoint (renew the external mortar joints, or pointing) when needed. Get rid of efflorescence, wash off dirt and eliminate mold with weed killer. Keep in mind that exterior and interior walls should be treated differently, because exterior brick comes into contact with ground elements. The Brick Industry Association also advises using a porous paint for exterior brick walls, so the brick can breathe. “Choosing a high-quality paint is vital for painting brick successfully,” says Watson. Both Watson and Crocker recommend using specific masonry paint products for painting brick, starting out with a conditioner and a primer, and then using a breathable latex exterior or interior paint, like Sherwin-Williams’ SuperPaint Acrylic Latex. Zumeta recommends looking into having your brick professionally stained, rather than painted. Although it can be more expensive, a brick stain penetrates the pores of the brick, unlike paint, which simply sits on the surface. It creates new color without some of the long-term risks that come with paint.